This recipe should be called “The Delicious Fluffy Cheesy Eggs, Crispy Pancetta, Shallots and Spinach in a Flaky Crust” to give you a better idea of how satisfying this quiche really is. If you love bacon (Italian bacon), cheese, spinach, and onions, then this recipe is for you! It’s also perfect for breakfast, lunch, and dinner, or even a brunch party. Your friends and family will love it. Once you make this, it won’t be the first time. Pretty soon you’ll be a quiche aficionado! Separate the dough into thirds. Note: Separating it into thirds will result in three thin crusts. If you prefer a more substantial crust, separate it in half. Form 3 evenly sized balls of dough and place each dough into a large Ziploc bag. Using a rolling pin, slightly flatten each ball of dough (about ½ inch thick) to make rolling easier later. Seal the bags and place them in the freezer until you need them. (If you will be using it immediately it’s still a good idea to put in the freezer for about 15 to 20 minutes to chill). When you are ready to use the dough to make a crust, remove from the freezer and allow to thaw for 15 minutes. On a floured surface roll the dough, starting at the center and working your way out. (Sprinkle some flour over top of the dough if it’s a bit too moist). If the dough is sticking to the countertop use a metal spatula and carefully scrape it up and flip it over and continue rolling until it’s about ½ inch larger in diameter than your pie pan. With a spatula, lift the dough carefully from the surface of the counter into the pie pan. Gently press the dough against the corner of the pan. Go around the pie pan pinching and tucking the dough to make a clean edge. If using a 9″ tart pan like this recipe, roll your rolling pin over the dough edges in tart pan cutting off extra bits. Over medium heat, sauté pancetta in olive oil until lightly crisp. Add shallot and cook until translucent. Add spinach and allow to wilt. Remove from heat. In a medium bowl, whisk together eggs, milk, cheese, salt, and pepper. Place the pancetta mixture into the egg mixture. gently mix. Pour into pie crust. Place the pan on a rimmed baking sheet, cover lightly with aluminum foil, and bake it for about 40 to 45 minutes. Remove from the oven and allow to sit for 10 to 15 minutes. 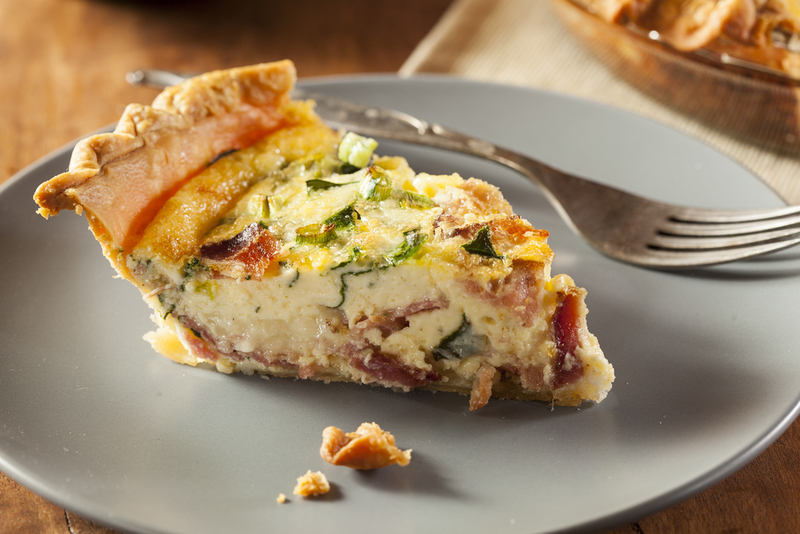 If using a tart pan, remove the quiche from the pan, cut into slices with a sharp serrated knife, and serve! Want Another Recipe? Now Watch How To Make This Tater Tot And Sausage Casserole!